I am just finishing off the book Evangelicals and Tradition: The Formative Influences of the Early Church(2005) by Baptist theologian D.H. Williams. Really good book and highly recommended for those wishing to revisit the early church and explore the relationship between the Scriptures and tradition. Williams argues that, according to the early fathers of the church, the Bible is not a one-dimensional book that gives way easily to detached scientific hermeneutical method, but rather is a multi-layered revelation. He warns against the dangers of a Sola Scriptura divorced from the foundational tradition of the church (Nuda Scriptura) and suggests a more mystical nature of Scripture that gives itself to the pure in heart in the context of worship and community. This reminded me of the late missiologist Paul Hiebert’s doxological or “tropological” theology that I have discussed here under Icons and the Possibility of a Tropological Theology. Maybe. Maybe not. 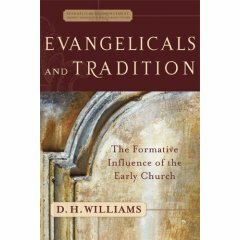 If you haven’t read any Williams, then his earlier book, Retrieving the Tradition and Renewing Evangelicalism: A Primer for Suspicious Protestants is probably a better book. It is more edgy, prophetically cutting, and a more appropriate place for Protestants to start. ‘Evangelicals and Tradition’ brings out a few issues readers had with the earlier book but spends more time dealing with the relationship between Scripture and tradition and explores a hermeneutic that integrates mystery and allegory as well as the literal meanings on the surface. It feels more like a Seminary textbook that his earlier book. The other book to buy as a companion to Retrieving the Tradition and one that links William’s ressourcement challenge with the current emerging church movement is Remembering Our Future: Explorations in Deep Church, edited by Andrew Walker and Luke Bretherton. This book, like Williams’ Evangelicals and Tradition, are part of the same series called Deep Church, a term coined by C.S. Lewis in the 1950’s. After you have devoured those two books, Evangelicals and Tradition will make a tidy Trinity on your bookshelf . . . ah . . I mean trilogy. Williams also wrote, “Tradition, Scripture, and Interpretation” which was the second book in that series. I didn’t realize it was in two different series. Interesting. i really like D.H. Williams. I have read other things he has written, but not this. What I appreciate the most about his work is moving Baptist Identity away from being characterized buy what “they” (of I, since I am a baptist minister) don’t believe, into looking what they have in common with other Christian denominations. It really is sad that for many evangelicals anything remotely catholic should be avoided at all costs. Williams work really does show that the Great Tradition is compatible with Baptist (and Evangelical) ideals. art – i dont know. it might have been repackaged for uk audience. That’s what is was. I just checked Amazon UK. In the states it was published by Baker Academic in the series Evangelical Ressourcement: Ancient Sources for the Church’s Future. In the UK it was published by Authentic Media in the Deep Church series. Previous Post (p)	Stuff with us this week.